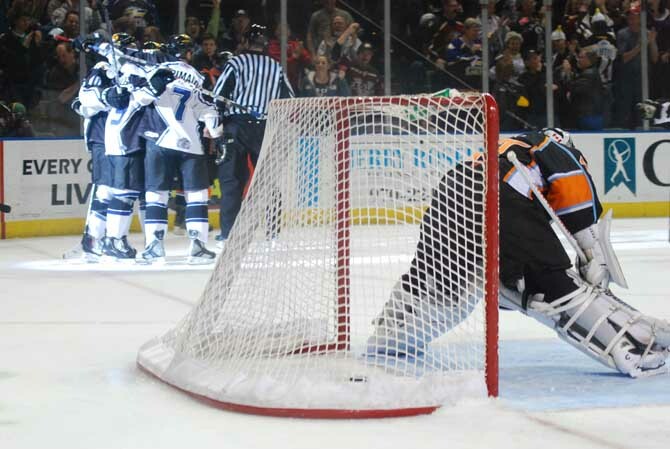 LOVELAND, Colo. – Steve Haddon recorded his first career hat trick and Andrew Penner nearly recorded his second shutout of the playoffs as the Colorado Eagles defeated the Missouri Mavericks, 5-1, to take a 2-0 series lead in the best-of-five Turner Conference Semifinals. Game 3 will be in Independence, Mo. 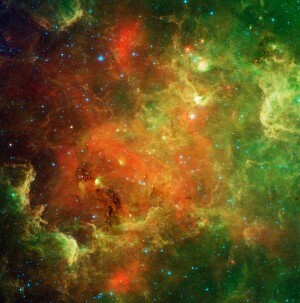 on Tuesday, April 19. The Mavericks came out with their best effort of the series in the opening period, but Penner continued his strong playoff play — stopping quality chances from Toby Lafrance and Mike Berry 1:30 apart early on — with several great stops to snuff out their surge. And with 29 seconds remaining in the period, Haddon put home an Aaron Schneekloth rebound on the power play to give Colorado the all-important first goal and its accompanying lead into the first intermission. Missouri was awarded over a minute of 5-on-3 play in the first half of the second period, but the Eagles’ penalty-killers continued their stellar play with a big kill. And at 11:36, Adam Hogg intercepted a pass just inside the blue line of the offensive zone and sent the puck to Haddon who beat Robby Nolan from in close for his second goal of the game. Then, at 13:55 of the second period, Penner took advantage of Missouri changing lines on a Colorado power play and sent a heads-up lead pass to Daymen Rycroft who fed Haddon for a breakaway all alone on Nolan for his third goal and a natural hat trick. The goal marked the third playoff hat trick in team annals and made Haddon the first player in Eagles playoff history to score more than one power-play goal in a single game. 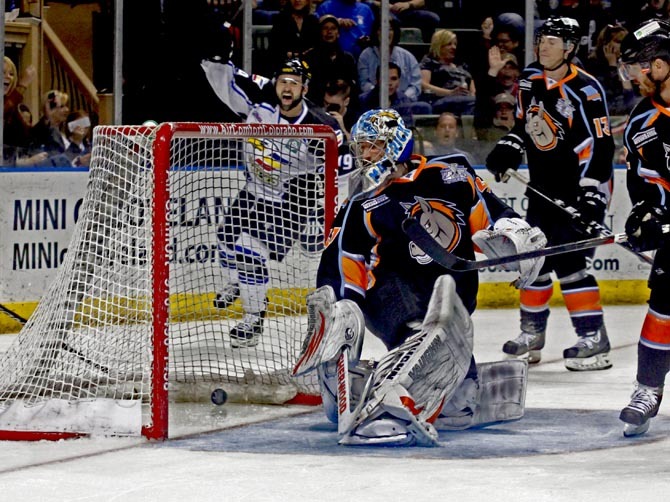 The assist was Penner’s first point since the 2009 playoffs and gave him two playoff points — more than any other goaltender in franchise history. And at 16:43, Colorado’s top line went back to work with a play that developed all the way back in their own zone and took advantage of several crisp passes to result in Riley Nelson’s sixth goal of the playoffs (most in the league). That goal — by the regular season’s Most Valuable Player — chased Nolan — the regular season’s Most Outstanding Goaltender — from Missouri’s net after stopping 16 of 20 shots in 36:43 of play. 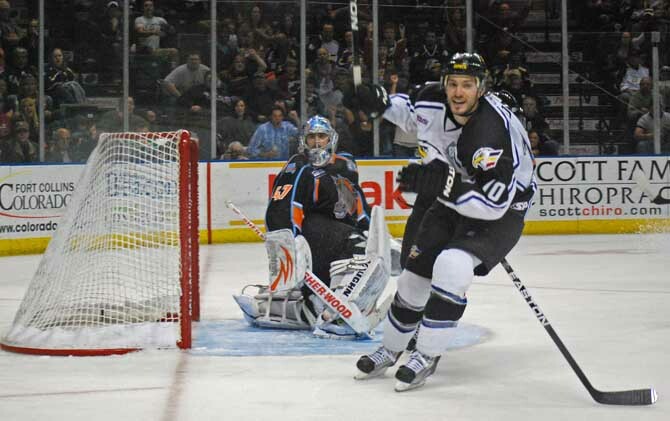 Colorado made it 5-0 at 2:25 of the final period with their third power-play marker of the game (they scored just two in their previous playoff series) when Ulanski picked up a loose puck to the right of the crease and beat Gerry Festa. 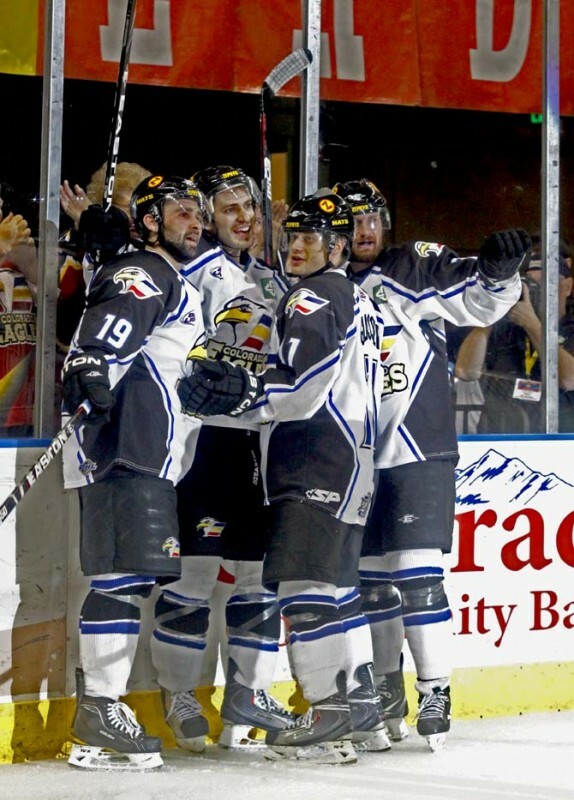 The Eagles’ penalty killers were tested once again midway through the period when the Mavs were awarded a five minute power play, but Colorado came through shorthanded once more and received a standing ovation from the home crowd upon the penalty expiring. With time running out, Penner looked to have his second shutout all but secured until Ryan Jardine put the puck in the net from the doorstep at 18:12 as the teams skated 4-on-4.